This is coming after the APC National Working Committee (NWC) reportedly named Uzodinma as the party’s governorship candidate in Imo. Uche Nwosu, the son-in-law of the Imo state Governor, Rochas Okorocha has expressed shock over reports that the All Progressives Chairman (APC) chairman, Adams Oshiomhole submitted the name of Senator Hope Uzodimma as the party’s governorship candidate in Imo to the Independent National Electoral Commission (INEC). This is coming after the APC National Working Committee (NWC) reportedly agreed to field Uzodinma as the party’s governorship candidate in Imo. According to Vanguard, the NWC took the decision at a meeting on Wednesday, October, 31, 2018. The APC NWC earlier cancelled the governorship primary election which was conducted on October 1, 2018 in Imo. According to reports, the exercise supervised by the Ahmed Gulak led Election Committee and Uzodimma was declared winner. Speaking on the Imo primary, Oshimhole said “Imo was not too good news for today, but not surprising they have to learn to begin to comply with rules, they have two fake results, none of them is genuine. Some APC chieftains disagreed with the APC chairman and also vowed to boycott any new primary election in the state. Speaking on the latest development, Nwosu said that Oshiomhole cannot stop his governorship ambition. The Governor’s son-in-law also said that he is APC’s authentic governorship candidate in Imo. Nwosu vowed not to leave the ruling party or abandon the mandate given to him by the people. He said “My mandate is still intact, I still remain the candidate of the APC, I am very much shocked with the National Chairman who is speaking from the both sides of his mouth as a man of that age I thought he would have been upright. “I am shocked that a man who has attained that age and who we should look up to as our role model has become somebody who many of us can no longer see as a role model again. “I am shocked at the attitude of the National Chairman which does not give hope to young people that mostly look up to him for years. “I will not leave APC, I still remain the authentic candidate of that party, I still have a valid Court Oder restraining the party from submitting any other name and also restraining INEC from accepting any other name other than my name and the matter is in Court. “So if they go anywhere and got another Court Order without knowing that there is a subsisting Court Order that must have been done that in error. “So the fact remains that I am the candidate of APC, it is just for a while and I will take up my mandate, I don’t have in mind to leave the mandate I already have for another party. “I will never abandon the mandate given to him by the party members to be their governorship candidate for the 2019 election. 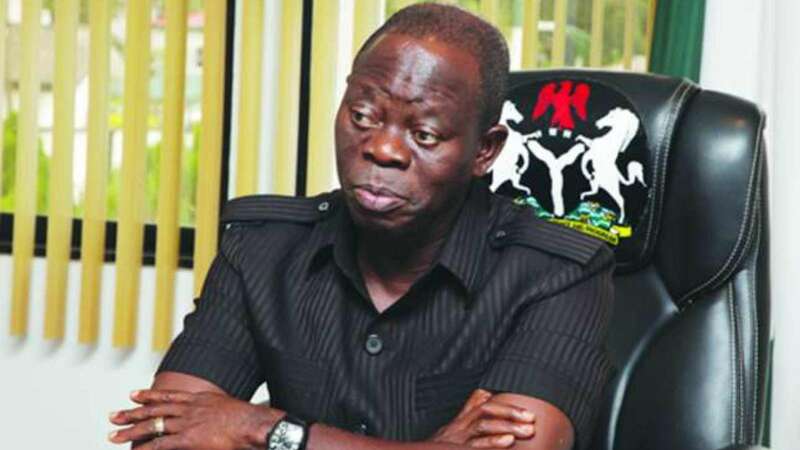 “We are disappointed over Oshiomole’s action, his statements and antics did not give hope to young people who hitherto had always looked up to him. “After all Oshiomole’s son is a member of the Edo State House of Assembly, who he nominated and he is the Chairman of the party and he is saying that Okorocha’s Senatorial ambition scuttled my governorship. “He is a man that is supposed to speak rightly and not deceive the people on air. I saw him on the Television when he was talking from both sides of his mouth. Following the outcome of the NWC’s decision, Governor Okorocha accused Oshiomhole of pulling the ruling party backwards. In his response, the APC chairman described the Imo Governor as an embarrassment to the party, adding that he will not allow Okorocha have his way with his undemocratic tendencies. Uche Nwosu also served as the Chief of staff to the Imo state Governor.